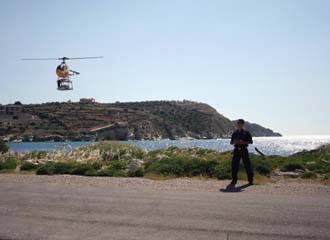 A participant operates an unmanned aerial vehicle as part of the Maritime Interdiction Operation experiment conducted in Souda Bay, Greece on June 6-10, 2011. Maritime first responders receive assistance sizing up a possible nuclear weapons threat at sea. An international group of maritime security experts is working to knit together the latest communications technology to identify small ships bearing nuclear weapons. The goal is to give first responders patrolling the world’s harbors and coastlines instantaneous access to experts to quickly size up possible threats in port or on the high seas. The effort is led by Dr. Alex Bordetsky, an associate professor in the Department of Information Sciences at the Naval Postgraduate School (NPS) in Monterey, California. Bordetsky is the principal investigator for the Networking and Interagency Collaboration During Maritime-Sourced Nuclear Radiological Threat Detection and Interdiction. For years, much of the focus on maritime security has been on the potential for conventional weapons of mass destruction or nuclear devices to be brought into the country on larger cargo vessels. U.S. Department of Homeland Security (DHS) officials continue to work on both the policy and the technological challenges of scanning the cargo containers on large, ocean-going container ships, but security officials also are concerned about smaller vessels. These tinier ships could transport radiological or nuclear materials, or the smaller components of larger weapon systems. Unlike large ships, which must be processed through ports of entry, smaller ships often come and go without the need to report to authorities—creating a quandary for officials. Since 2002, Bordetsky has been leading research and an ongoing series of Marine Interdiction Operations (MIO) exercises in conjunction with the NPS, the U.S. Navy, U.S. Special Operations Command, Lawrence Livermore National Laboratories and the Department of Energy to explore the possible uses of new and emerging technologies to address the problem. In recent years, the effort has drawn the attention and active participation of NATO, Sweden, Germany and Greece. Last September, the first Asia-Pacific nation, Singapore, signed on as a participant in the collaborative research effort. “Our task has been to explore the solutions,” Bordetsky explains, “for countering maritime sources for the radiological/nuclear threat brought up by small craft, and exploring the benefits of ubiquitous networking between boarding officers, center operators and remotely located experts.” The challenge, he says, is to detect and track possible targets, many of which are on the move. The solution, which has been under constant development and refinement for nearly seven years, ties together communications and electronic technologies into what Bordetsky describes as a continuous cyberpresence. At its center is a network of sensors, unmanned systems, screening portals, modeling and simulation computer programs and other technologies. In describing this network, Bordetsky says its success depends largely on being ad hoc, mobile, self-forming, and able to adapt quickly and to provide a steady, two-way stream of information. He explains that to be useful to marine first responders, such a network would have to adapt on the fly to quickly changing situations. As an example, he says that a swimmer might discover a suspicious package onboard a suspect vessel. While he is transmitting his sensor data over the network for evaluation by land-based experts, the vessel might begin its escape and would need to be tracked not only by patrol boats on the scene, but also by harbor-based sonar and possibly by satellite-based sensors as well. Developing the network’s ability to change and adapt to such a scenario is part of the ongoing research being conducted by Bordetsky’s research coalition. The network is the result of a series of MIO experimental exercises held with partners in the research project since roughly 2005. In the beginning, Bordetsky says, the MIOs took place quarterly, but in recent years, exercises have been held about twice a year. 1. Use of ad hoc mobile networking technologies to integrate tactical-level boarding teams with geographically distributed technical subject matter experts and data fusion centers. Use of information management architectures to share alerts from threats aboard small maritime craft or between land borders or ports of entry and to translate active and passive detection alerts into situational awareness and a common operating picture. Surveillance techniques that enable global locating, tagging and tracking of small maritime craft transporting illicit materials. Mission control operational constraints related to search models for standoff and high-speed drive-by detection. Cyberdistortion during technical expert reachback situational assessments and measures to compensate for that distortion. One exercise was held last June at the NATO Maritime Interdiction Operational Training Center (NMIOTC) in Souda Bay, Crete, the largest and southernmost of the Greek Islands. The post-exercise report (see box, page 48) describes a scenario in which small maritime craft were transporting nuclear/radiological material illicitly to U.S. and NATO installations. In some cases, the target vessels involved were small, network-operated unmanned surface vessels (USVs) provided by Greece’s Hellenic Naval Academy. The MIO provided researchers an opportunity to test the latest developments in using small, handheld detectors to provide the latest information on shipboard threats. Investigators tested new surveillance techniques that enabled land-based monitors to geolocate, tag and track small vessels believed to be carrying illicit materials. Participants also tested detection and interdiction techniques near the Swedish port of Karlskrona, which eventually led the exercise boarding teams to a test vessel located in Crete. Another previous MIO was held in California’s San Francisco Bay during summer 2011, this time involving San Francisco Bay Marine Police, the U.S. Coast Guard and project partners from Germany, the Czech Republic, Sweden and Singapore. The next MIO is expected to take place this summer in the Baltic Sea. Bordetsky says that the project to give maritime first responders a high-technology lifeline to radiological experts is a direct outgrowth of another program he pioneered, known as the Tactical Network Testbed (TNT). Bordetsky has described the TNT as providing for the adaptation and integration of processes between people, networks, sensors and unmanned systems. It enables plug-and-play tactical on-the-move sensor-unmanned systems networking capabilities combined with global reachback to remote expert/command sites. The network testbed program was started at the NPS as a means to enable faculty and graduate students to extend their research into a field environment. Bordetsky estimates that the NPS has invested approximately $2 million for its share of the expenses in the exercises during the last six years. The total costs of the MIO exercises are shared among the partners of the research collaboration; therefore, it is hard to determine exactly how much has been spent since the exercises began in earnest in 2005, he reports. Bordetsky explains that the goal for his team of international researchers is to conclude its research with a package of recommendations that the partners can bring back to their parent country’s maritime officials to develop their own MIO networks in the future. Because many of the networks’ communications and electronic elements already are deployed and developed, he forecasts that final recommendations for a unified system could be completed by his research team in approximately five years.